A major research breakthrough in detecting sound suggests we will soon be able to understand whales and elephants and even diagnose our own health more accurately. 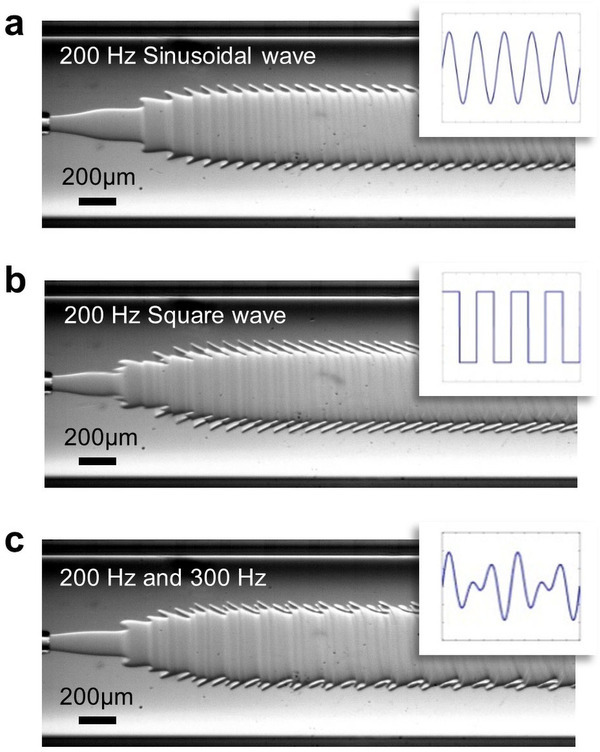 A group of Hong Kong University Mechanical Engineering undergraduates have found a way to monitor noise beyond the human frequency range through Cymatics in what the paper calls: "the first direct visualization of music in the form of ripples at a microfluidic aqueous-aqueous interface". Somewhat counter-intuitively, the team used the visual appearance of sound when transmitted through fluids, to recognise and effectively "hear" it. They were able to transmit Beethoven's 5th symphony into fluid and read it back with a Laser Displacement Sensor to 97% accuracy using the visual patterns it created. Interestingly, the patterns themselves were identified through different types of wave (square, sine, etc) familiar to anyone who has used a synthesiser. When the sounds became more complicated the ripples changed and therefore could also be mapped. Since large animals like whales and elephants communicate using low frequency sounds way outside of our hearing range (below 10Hz) it is believed the same technology will help us to understand them. Another potential application is the ability to monitor tiny biological changes in our bodies such as heart rate or blood pressure that would otherwise be unnoticeable. The prevailing belief has been that fluids are a poor transmitter of sound because they lose too much information. But the team, overseen by Dr. Anderson Shum, took inspiration from the human ear which itself uses fluid. This fluid helps to protect the ear but the high sensitivity of the ear's inner hair cell stereocilia bundle means it can accurately register the sound. This finding has the potential to usher in a whole new era of sound reproduction, perhaps radically changing microphone design.